Last October the beer drinkers at the Eastbourne beer festival voted for Frog Island’s ‘Croak and Stagger’ as their beer of the festival from outside Sussex. At the end of February, seven members of South East Sussex Branch of CAMRA made the train journey to Northampton to present the trophy in person. Arriving Saturday lunchtime, the first thing we noticed about the town was a horrible smell. This turned out to be caused by the Carlsberg factory, a 1970 concrete structure, sadly built on the site of the real ale Phipps brewery, bought up and closed by Watneys in the late sixties. Our first destination was a pub just across the road, the Malt Shovel, which as well as being the tap for Great Oakley Brewery, serves Frog Island beer and an impressive range of ales from other places. 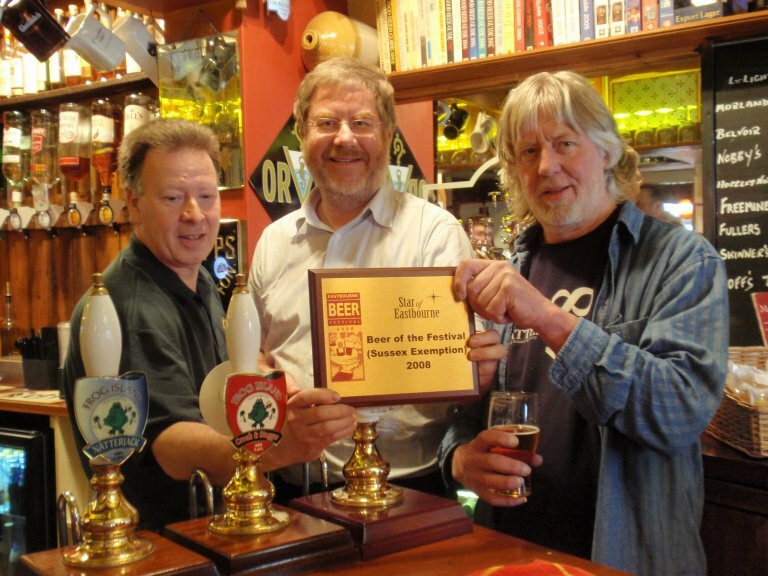 In here the factory was quickly forgotten as branch chairman, Peter Page-Mitchell, presented the trophy to Bruce Littler of Frog Island, (pictured behind the bar of the Malt Shovel). After some excellent ale and lunch, we made the two mile journey to our hotel, some on foot, some by taxi. In the late afternoon and evening, we set about researching the Good Beer Guide pubs of Northampton. We were not disappointed, visiting all of those within walking distance of the town centre, sampling an excellent range of beer styles from a wide range of breweries.